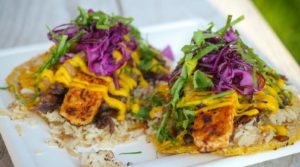 If you’ve tried the scrumptious street tacos from Grow Benzie’s food truck this season, you’ve probably met Chef Loghan Call. His passion for healthy foods shines through his homemade tortillas and use of local produce. 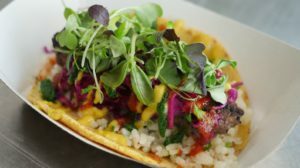 Chef Loghan has been busy serving up Michigan brunch tacos and other made-from-scratch street foods across Northern Michigan. 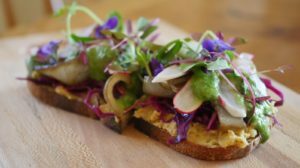 He takes a moment to dish on his plant-based menu and why now is the best time of year for cooking with local produce. Tell us about your culinary background and what brought you to managing Grow Benzie’s food truck in 2018. I actually didn’t start my professional career in food, but media. I spent years trying to find satisfying work in the industry. Ultimately I realized if I wanted to make the greatest difference possible from an environmental and community perspective, food was my answer. So my journey with food is a little more unique than most chefs in the sense I’ve come from the perspective of wanting to change the industry from the top down. I studied systems thinking at UCLA, which has inspired me to figure out how I can create a regenerative systems approach to our industry. My culinary journey started in southern California, with a pit stop in southern Missouri to work for Baker Creek Heirloom Seed Company, then finally to Northern Michigan. I landed here thanks to my good friend Taylor Moore (who manages the Food Rescue program here in the area) convincing me this area was primed for cultivating a regenerative food future. 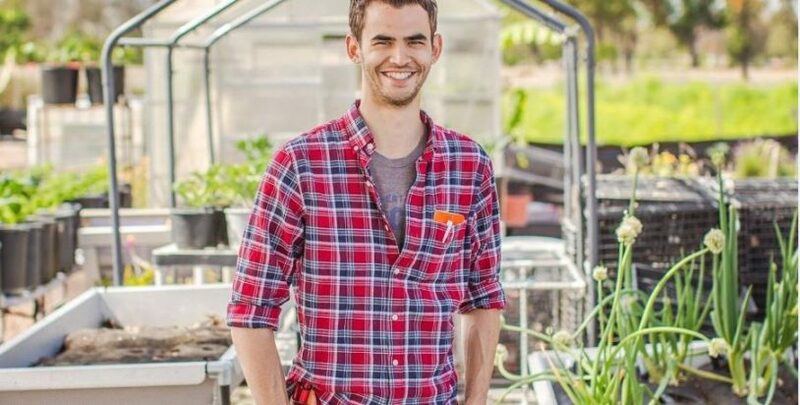 After a stint of being the executive chef at Goodwill and working with Taylor to better understand this community and all of the wonderful leaders here, I met Josh Stolz this past spring. At the time they were just starting the process of finding someone to run the truck for the summer. From our first meeting, it was clear our visions aligned in many ways, but most importantly we both have a passion for systems thinking. I wanted to be bold with the menu and approach for the food truck—all vegan and hyper-local. Grow Benzie’s mission aligned well with that thought process. Can you share with us more about your local street food menu and your current favorite item? Absolutely! I’m really proud of how the menu has evolved over the course of the summer. It’s changed weekly to showcase the best of what our farming partners have coming off the fields. Everything (except Harwood Gold’s Maple Sriracha) is made from scratch and inspired by the flavors of the season. Also, all of the produce we use is sourced right here in this region, and 95 percent of everything we use is sourced within Michigan. This is in large part thanks to Cherry Capital Foods, which makes Michigan sourcing a breeze for chefs. As for the favorite? I think my regular customers would be offended if I said anything other than our tacos. At the beginning of the year, I wanted to have tacos on the menu but I couldn’t find any good organic and non-GMO corn tortillas anywhere. I started making my own but quickly realized how labor intensive they were. They tasted great, but I struggled with how much time it took on my end to hand press hundreds of tortillas. At the end of the day, I realized this was the perfect opportunity to talk about the importance of doing business the right way and to not cut corners, which is so easy to do in our industry. I decided to trim down my menu to enable time to make the tortillas by hand. The feedback has been outstanding and clearly show it’s been worth the extra effort. 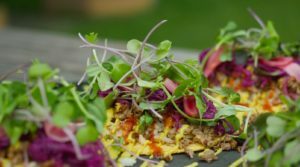 We’ve been featuring a Michigan brunch taco that has blue potato hash browns, sesame rice, Michigan-sourced tempeh (which is glazed with maple sriracha), heirloom tomato salsa, umi pickled purple cabbage, micro greens and daily special sauces. It’s a rather large taco by the time it’s built, and full of flavor. We know how important promoting healthy foods and local produce is to Grow Benzie’s mission. With fall harvest coming up, what local foods are you focusing your menu on? Oh man, this is the best time of the year. As I mentioned earlier, everything we use is local because our region is filled with talented farmers. As an example, one of my absolute favorite and main farms I source from, Loma Farm, has about 60 different items to choose from each week at this point in the season. Between Loma, Lakeview Hill Farm, Providence Farm and Second Spring just to name a few, it’s almost too much to try and choose from. On our menus we’ve started to use more of the root and squash crops. We’re also infusing dishes with things like cilantro, hot peppers and tomatoes. It’s the sweet spot between having late summer crops and the start of winter ones. Regardless of the dish, I always start with the notion of putting health and wellness at the forefront. For instance, many of our sauces and oils have turmeric in them, which is arguably the most beneficial herb there is. For me, it’s all about building menu items that are healthy for us and still bursting with flavor and texture. We love that the food truck travels across Northern Michigan to various farmers markets, breweries and of course, Grow Benzie’s HQ in Benzie County. According to your online calendar, your season is wrapping up at the Traverse City Harvest Dinner October 13. What do you have planned? We’re going to be helping out with this year’s Harvest Dinner (Groundworks annual fundraiser), as it will be the first year multiple chefs and partners are teaming up to knockout Michigan’s largest farm-to-table dinner. Our team will be spearheading the vegan dishes for guests. As for Grow Benzie, we always have a great series of ongoing potlucks, cooking classes and educational evenings. Be sure to check out everything we have to offer on growbenzie.org or the Grow Benzie Facebook page. What’s next on your personal food journey? I’m happy to say I’ve realized I’d like to call Michigan home from both a personal and business perspective. Currently we don’t have a 100 percent vegan restaurant in the area. I’d like to be the one to make that happen. As I move out of the food truck I’ll be focusing on figuring out the perfect location and forming the team. I’d love to hear from anyone who might be interested in creating the restaurant of the future, right here in Northern Michigan. In the meantime, I’ll be doing pop-up dinners, cooking classes and private chef work. 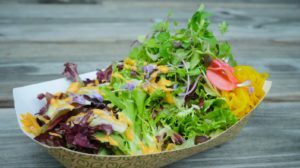 Events and other offerings will always be posted on plantedcuisine.com.